The session view panel displays thumbnails of all documents in the current session. Here the user can change between documents, merge and split pages and document, rotate and remove documents and pages. The session view will also display page numbers for multi-page documents. The feature must be enabled from Tools->Settings->Interface: Show page numbers. Remove page – removes the currently selected page. The user can remove only a single page from a multi-page document with this option. Remove document – removes the entire document with all its pages. Process pending pages – processes pages that are marked as pending. This feature will work only in the case where automatic document processing has been turned off. The user can turn it on or off by checking “Enable auto process pages” from the Session menu. This feature is useful if the user does not wish to process all of the loaded pages or documents. Rotate page clockwise 90 degrees, Rotate page counter clockwise 90 degrees, rotate page 180 degrees – rotates the currently active page at the appropriate degree. Rotated pages cannot be automatically re-processed. The user must fill in the form fields and column manually by typing into them. Append current page to previous document – Appends the currently active page to the page or document above it. The keyboard shortcut for this feature is CTRL+SHIFT+PgUp. Append current page to next document – Appends the currently active page to the page or document below it. The keyboard shortcut for this feature is CTRL+SHIFT+PgDown. 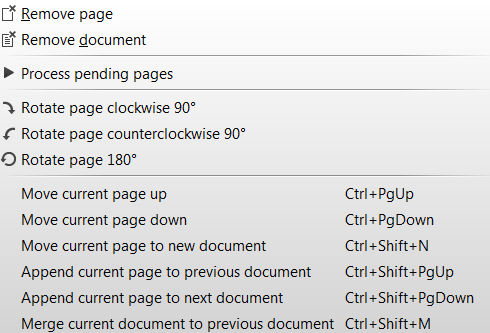 Merge current document to previous document – Merges the currently selected document to the one above it. Useful for multipage documents where the user needs to merge more than one page to a previous page or a document. The keyboard shortcut for this feature is CTRL+SHIFT+M.